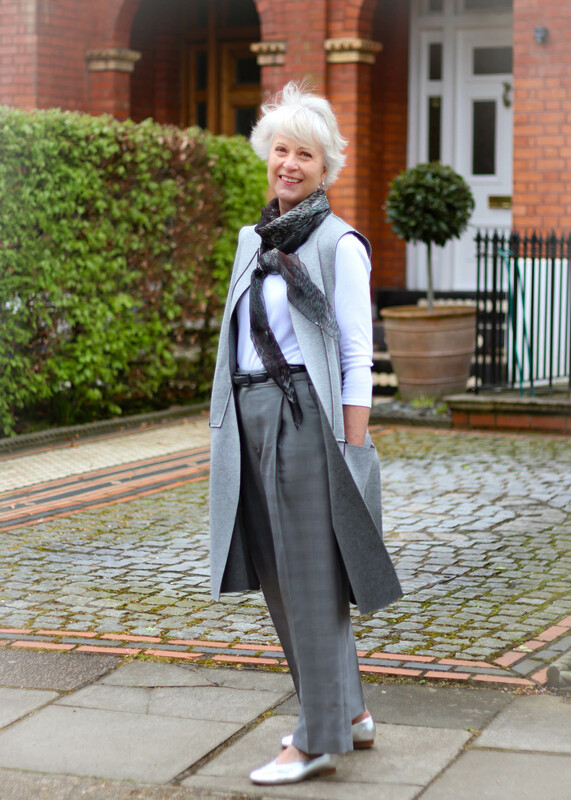 I recently showed you how I wore my new grey checked trousers as part of a trouser suit. If you missed it you can check it out here. I had a couple of comments on the length of these modern style trousers. In some ways I understand what you mean. Personally, I think that they are fine for the summer. They have a 2cm hem so I will probably lengthen them come the Autumn so that I can wear them with my ankle boots. I am a great believer in maximising my wardrobe. I like to mix things up and wear individual pieces in different ways. So I decided to team the trousers from my suit with a plain white tee and a long line sleeveless gilet for a more casual look. I like the way the scarf blends with the colour scheme and at the same time adds a contrasting print. My M&S silver pumps (US link) adds a touch of bling. 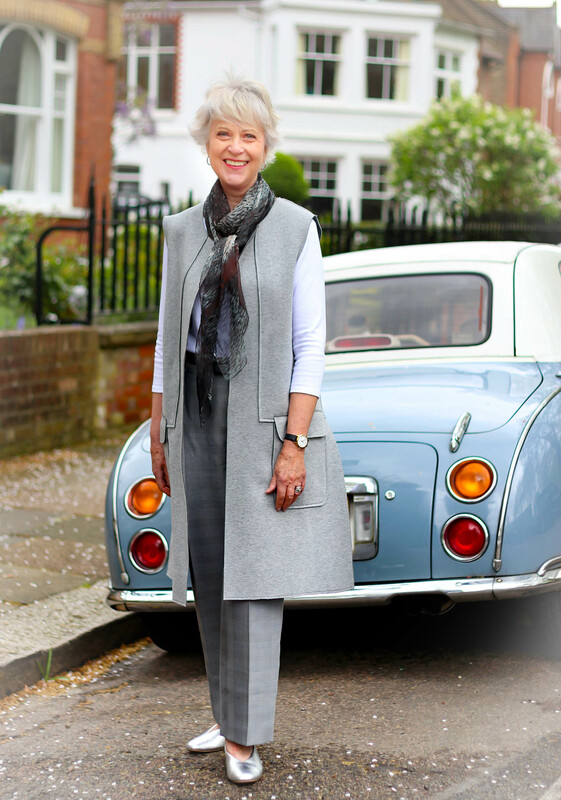 I am a great fan of longline cardigans and sleeveless gilets. In my opinion, they are a great way to cover our bums and hips and create a continuous vertical line thus adding an illusion of height. If you are petite I would recommend choosing a shorter option. They lift an outfit from casual to smart casual and can be worn for work or play depending on how you accessorize them. The photographs were taken in Barnes village by Laura Hines, follow her Instagram. I like that outfit, Josephine. You look great. Must confess I always wear a longline cardi over trousers and a white T shirt. I have to make sure of the length of the cardi as I am only 5 foot 1. It’s there to hide my tummy : a problem you don’t have! I do have a bit of a tummy I can’t wear anything too clingy round the middle these days. Lovely outfit and looks really comfy. I admit that I didn’t care too much for those pants as part of the trouser suit, but this combination looks great! And I learned a new word… gilet! I had never heard it before, but as a lover of words I’m always delighted by a new one. I recently found a great website for scarves/pashminas: the pretty pash company. Think it is accessed via the Etsy website? 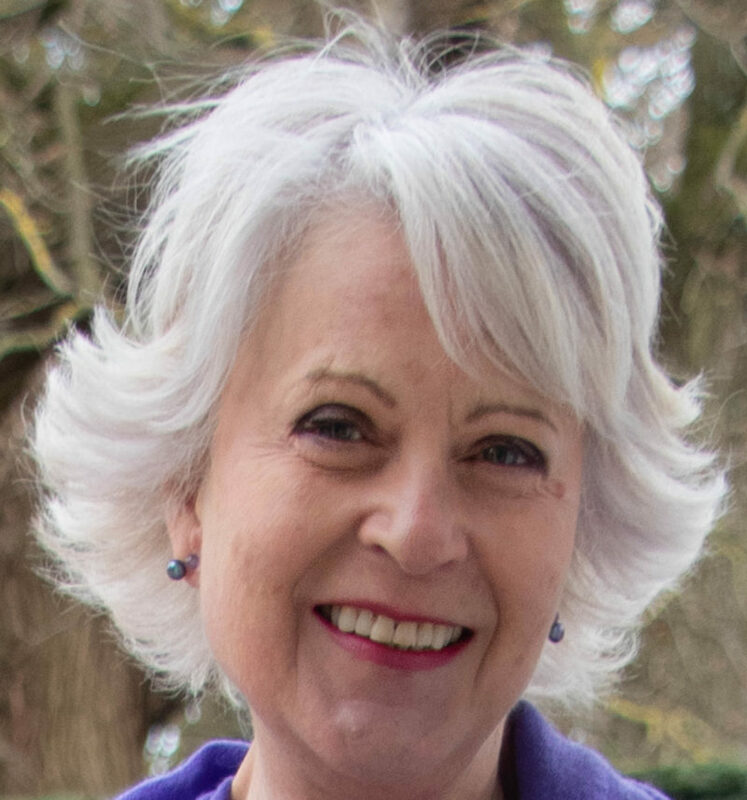 I bought a beautiful bright yellow scarf/pashmina in cashmere at an extremely reasonable price; delivery was very quick, packaging lovely and quality superb especially as it was a perfect match to my yellow Cos sweater.I love it! Think it’s quite a small company but such good service and lovely items deserve publicity and anything that has good scarves is essential as I couldn’t agree more about their absolute necessity. Thanks for letting me know. I could not find them on Etsy but I did find their site. They look nice and are very reasonably priced.